Teeth Veneers Ellisville Mo - How Teeth Veneers Are Done | Dentist Ellisville MO - Dental Care | Dr. Andrew G. Mitchell, DDS & A . Patients who want to transform chipped, damaged, discolored, or improperly spaced teeth can turn to dental veneers. This versatile cosmetic solution can be used to correct minor to moderate tooth imperfections, and in some cases, may replace teeth whitening treatment. If you are in the Ellisville, MO area, the team at Ellisville Dental can give you the smile you’ve been dreaming of with the help of dental veneers. Veneers are thin porcelain covers that are adhered to the front of teeth to alter their appearance. Porcelain is a strong, durable ceramic that is very natural looking. Porcelain reflects light similarly to tooth enamel, is stain resistant, and does not easily irritate the gums. 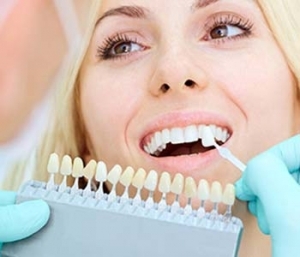 When patients come to us for veneers, the first step is to remove a small portion of the enamel to make room for the veneers and ensure that the overall thickness of the teeth does not change significantly. Once this is complete, impressions are taken and then sent off for fabrication. The veneers will be custom fabricated in a dental laboratory, based upon specifications determined during your consultation process. If the veneer is covering a single damaged tooth it will be designed to blend in seamlessly with other teeth. For patients transforming the entire smile, the veneers can be created based upon your desired final appearance. Once the veneers are ready, we will check to make sure they look and feel correct. We will evaluate fit, shape, and color by placing the veneers on the teeth and making note of any adjustments that need to be made. Minor adjustments can be done in our office. Once we are comfortable with the size and fit, the veneers are permanently cemented into place. To ensure a long-lasting bond, the teeth are etched with a special gel to ensure good adhesion. After that, a clear bonding agent and cement are used to secure it in place before finishing with a special curing light. If you are ready to have a brand-new smile, call us today at (636) 227-6945.